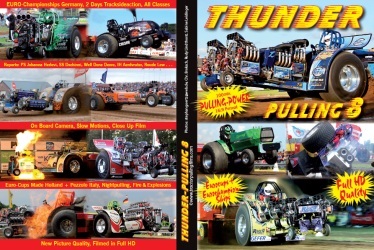 The new part of the successful Thunder Pulling Series is available. A spectacular, 100-minutes flashback of the Euro-Pulling-Season 2012. TOP QUALITY in picture and sound, filmed and cutted in FullHD. The Pullinghighlight of the season. A One of a kind Pullingentertainment with "The Voice of PULLING" ULF SCHNACKENBERG, who brings the fans to the edge of pulling. CloseUp footage of the Tractors in the pits and on deck heating up their engines. Ear-shatering Sound of the multi supercharged V8 engines. 2500 Hoursepower - Wheelstanding Action. With the front end in the air from start to finish, the Funny Cars create a tremendous Show. Sledge Hammer against Screamin Bobcat and Heartbeat. Turbine-Power, V-12 Allisons and Griffons against Multi V-8`s. Tractor Pulling on the highest level. The Pullingtrack vibrates. Earthshaking action in the Füchtorf arena. The Dingerinks and Lambada show their performance with one of the best Modifeds on Earth. 950 kg weightlimit and 2500 Hoursepower - there is something going on, and the Tractors are flying over the pullingtrack. Alkyburners Rocket Science, Woody Woodpecker and Mad Max. The most alternate division with the most exciting Pulls. Over 2000 horsepower out of one Turbo and standard engineblocks. Dieselpower pure. and the V-12`s Green Fighter, Green Spirit or Super Kasper. The great final at the European Championships. - Roude Lew the most powerful double-RADIAL-engine in the Light Modified division. Europes biggest EuroCup and Outdoor Pulling Event. On 3 days and 3 Pullingtracks, all the best european Pullingmachines fight for the EuroCup titles. Full Euro Cup and NTTO-divisions like the Unlimited Modifieds and Nightpulling under the lights. Spectaculare Scenes like the engine-explosions of ZAPO SUPER STOCK or the almost rollover of Rocket Science with closeup footage and slowmotions. A one of a kind and spectacular filmreport of this MegaEvent. Tulln: International tractors and Pro Stocks from Holland: Red Nex Steyr, Code Red IH, Red Attraction MF... first nightpulling show in Austria... "Fire in the Pipe"
Klopeinersee: V-12-Dieselpower in the Modified division like Morpheus and Final Destination and great tractors from Holland and Italy. "Four NoHemi" a US-Import built from Scott Tedder and running now in Italy, produced a great and dusty pulling show. PEZZOLO Italy, ZELE Belgium and Zwitzerland: Euro Cup of the 950 kg Modifieds with nightpulling. The best turbine powered Mini Modified HOT IRON in action. 1. Online with PayPal. Price Euro 19,90 plus Euro 3,-- postage. Press the button "ADD TO CART".